Think for a minute about the most famous buildings in the world - the Taj Mahal, The Palace of Versailles, the White House. Even without furnishings, fabrics, and framed artwork, they're stunning spaces - all because of their architectural details like millwork, windows, and doors. OK, so we're not trying to be that fancy around here! But it still proves that if you do them right, architectural details can upgrade even a casual farmhouse style room like nothing else! 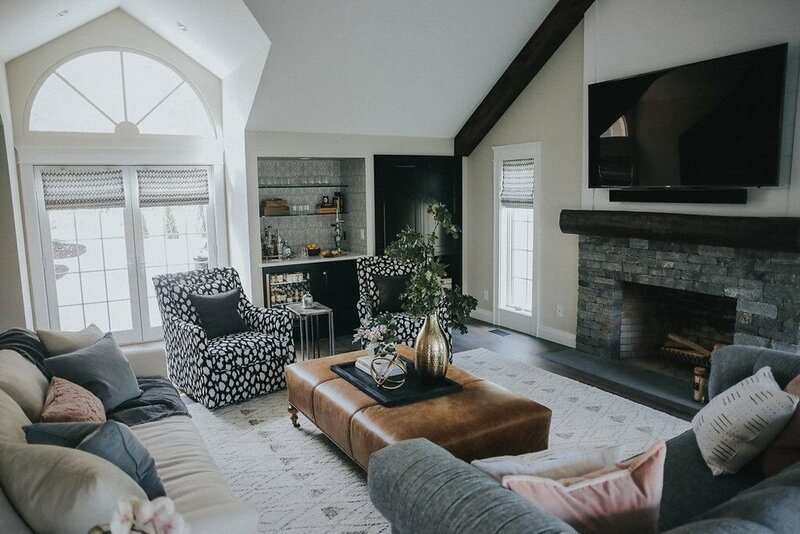 Along with casual but sophisticated furnishings and fixtures, we included lots of architectural details to freshen the space from top to bottom. Whether you're ready for a full-on renovation or just want to add something extra special to your home's architecture, here are a few ideas you can steal from this now beautifully updated home. 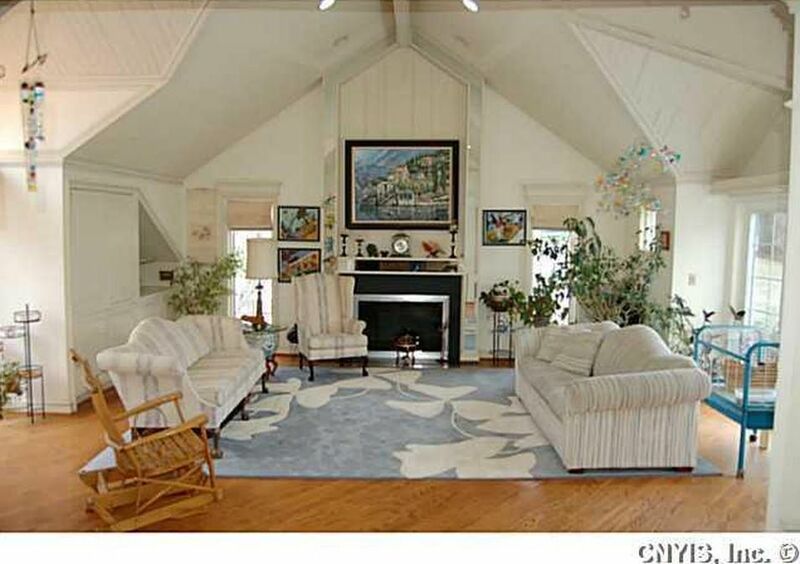 Exposed ceiling beams punctuate ceilings and add beauty to your home for years to come. 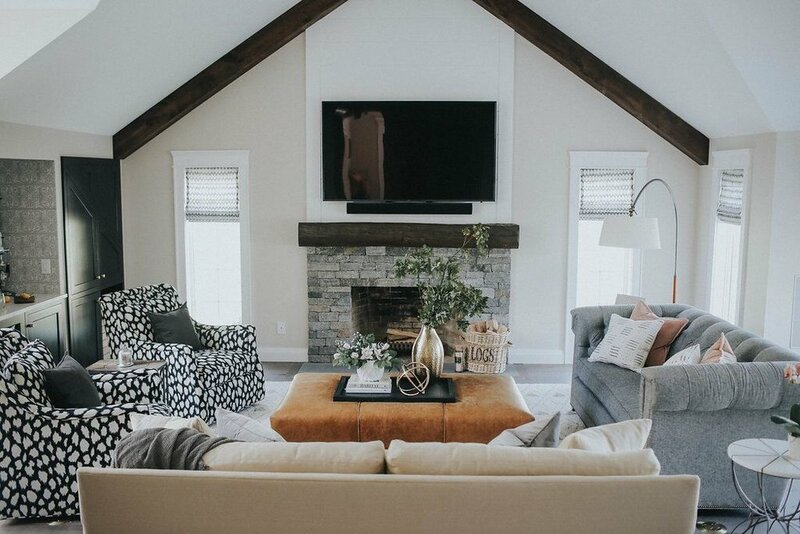 If you have particularly high ceilings or if they're vaulted like this one, beams will visually connect the ceiling to the rest of the room. We stained the mantles in the family room and breakfast nook to match the ceiling beams so everything looks cohesive. The addition of handcrafted crown moldings gives the rooms a truly 'finished,' customized look. It may sound strange but a staircase is an opportunity to add major modern farmhouse style to your home's architecture. Beyond paint, stain, and rug runners, the choices you make in your stairs' design and details can change the whole look of your home. Don't believe me? Just look at the old stairs with stock parts. Now look at the staircase after we got our hands on it. We custom designed and handcrafted everything - handrail, spindles, newel post, treads - to suit the home's architecture perfectly. It has a Mission style-meets-mid century modern-meets-farmhouse vibe that makes it feel timeless. The classic lines and sparse detailing make it graceful and homey at the same time. Plus, the quality of the craftsmanship adds something truly special, don't you think? 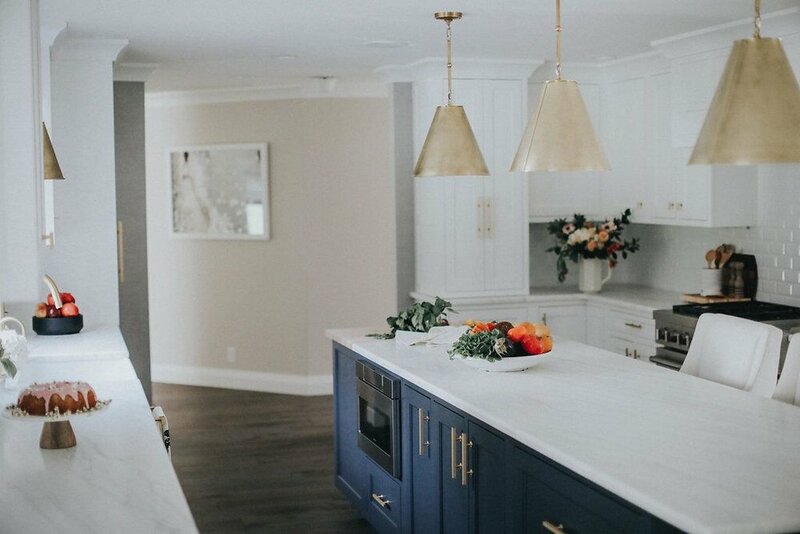 I know it's incredibly popular in the world of 'farmhouse style' to rehab old cabinetry with chalk paints, but I remain a firm believer in using furniture-quality custom cabinets for our kitchen designs. Well-made custom cabinets like the ones we crafted here help enhance your home's beauty like you wouldn't believe - not to mention its value! Brass hardware is totally classic, of course, but this unlacquered finish happens to be super trendy right now. Classic + trendy = a win/win in my book! We added even more excitement and a bit of the unexpected by painting the island a bold blue. The kitchen's wraparound beverage center is not only convenient, but also ultra modern in both form and function. And we can't talk about cabinets without mentioning functionality. Customized storage inside the cabinets plus a kitchen desk space will totally change how our clients use their kitchen. We took the beauty and value of custom cabinets beyond the kitchen into the living room with the built-in bar area, the downstairs bathroom, and the mudroom/laundry room to amp up the home's architecture even more. We added a beautifully textured wallcovering to the back of the living room's built-in bar and cut the adjacent 'pantry' cabinet doors to mimic the ceiling's angle. Little details really can make a big impact! The mudroom/laundry and the downstairs bath cabinetry will no doubt be some of the hardest working items in this home... but that doesn't mean they shouldn't be gorgeous, as well! When it comes to cabinetry, t's once again clean lines and simple detailing that lend a classic farmhouse look. So much better than chipped paint or punched tin, right?! Isn't it amazing how modern 'farmhouse style' can look?! Adding these kinds of details to your home will definitely upgrade its farmhouse style just like it did in our clients' beautiful 'new' home. 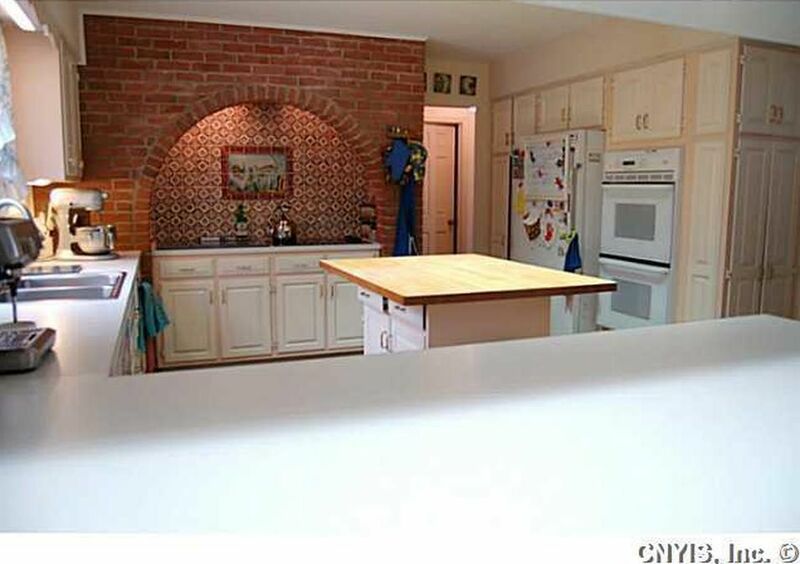 So what do you think you'll try - ceiling beams, a blue island, or both? !